Over the next few weeks, we’re transferring all of the articles on the website and my personal blog articles on food and health over to the CTF blog. I hope you enjoy this week’s article. This particular article was written before we moved to our current house. When we moved, our first priority was finding a BIG kitchen! I’ve been asked a lot recently about how to do traditional foods in limited space. Most people are surprised to find out that my house has a very small kitchen. My kitchen is actually the smallest room in the house, smaller than even the bathrooms. Our house was built in 1935 without indoor plumbing. The kitchen was located in the largest room on the bottom floor. When the house was remodeled 25 years ago, the family who remodeled it ate out 2 or more meals a day so the kitchen was a very low priority. I have very little counter and cabinet space. Instead of having bottom cabinets, I have a dishwasher and a trash compactor by the sink. 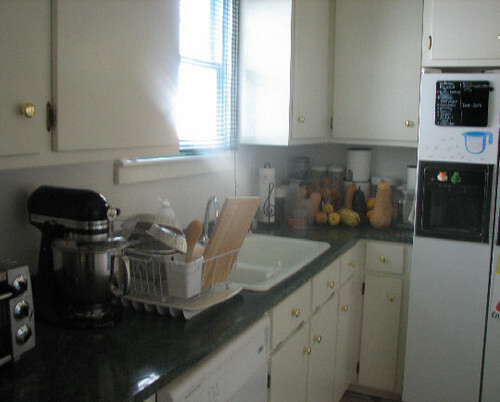 That only leaves three bottom cabinets, two of which are too deep to store many things in easily.